It’s now 2 weeks until the release of INSIDE THE WORLD OF DIE FOR ME, and I’m going to continue the contest countdown. 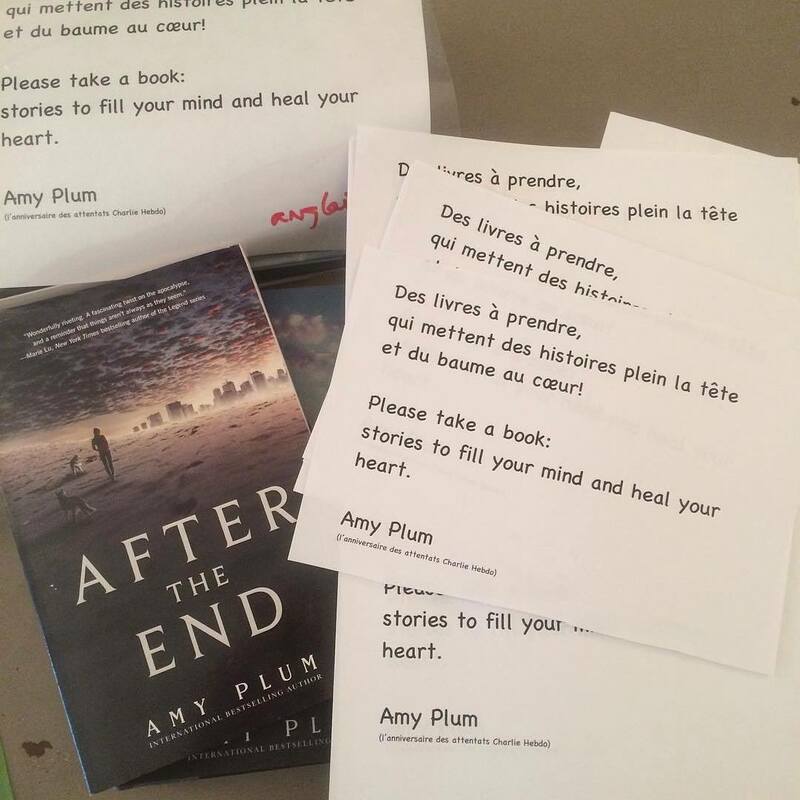 I am giving something away every day until Feb 9th, some days on Facebook, some days on Twitter (@amyplumohlala), and some on Instagram (@amyplum). —and a smaller prize the other days. This week’s tote-bag contest is … Create Your Own Revenant! To participate, you have to make up your own fictional character, either bardia or numa, and give them a back story. Place them wherever you want in history, give them an era-appropriate name, and situate them wherever you want in the world. Send your idea in an email to katieloumercier@gmail.com by Sunday night, and next Monday I will choose 1 entry to win the tote bag. Be creative! I can’t wait to see what you all come up with! Since yesterday was January 25th, the day when Anne Boleyn and King Henry VIII got officially married, this plot is about them and their doomed destiny. What if Anne Boleyn became Bardia and Henry VIII… Numa?! I’m a medievalist, too. Now back to our story… In 1536, the Queen sacrificed herself in order to save her daughter from his wrath, while he was cursed by a gypsy witch to walk among the humans without a purpose in life. King Henry VIII died as a human and was awakened as a Numa. With his memories erased by the witch, he had no clue who or where he was originated from. To the other people, Henry was just a broken man and not their former king. As the years passed by, he became a shadow of who he used to be. However, he didn’t grow older and after a few decades he met the witch and found out the truth: That he is an immortal and his name is Henry Tudor. Fast forwarding to the future – our present day – Henry (he decided to keep his original name) spots a young woman who brings up memories from his past life. The beautiful brunette is his second wife, Anne Boleyn – now named Rosalyn, who is a Bardia. What will happen with them in the modern era? Now, they are sworn enemies, she is good, he is evil. This is just a plot idea. I’ve always wanted to write a novel about The Tudors in the modern times and add some supernatural elements. In ancient Japan there is an all powerful numa leader, known only as ‘The First’, she was the first numa to ever come into existence and has the gift of sight (seeing the Aura). Her story is a sad one, she was just 16 when she fell in love but her sister was already promised to him. she begged her father to let her marry him, but would did not, for her sister and this man were already in love. She devised a plan, if her sister was to perish, HE would be free to marry her. So, in the dark of night, she grabbed her fathers katana and went to her sisters futon where she slept. She raised the sword up high, ready to bring it down into her sisters heart. But He was there. Sleeping along side her. He woke to see what was happening and jumped up to protect his love. He was in front of the blade when it came down but not before he too had drawn his own weapon and they died together. And then they woke up. She as a numa, He as a Bardia. except in Japan they are known as Hikari, The Light, and Yami, The Darkness. To this day they are enemies, as are all Bardia and Numa. But she still loves him and it is this love that fuels their hate for each other. ‘The First’ gathers up all Yami creating her army to fight the eternal battle of her love. they live as bandits and thieves, never staying in one place, and she is always thinking up new ways to get her revenge on the only man she will ever love. He has come to be known as ‘The Bringer of Life’. He too gathers others like him, other Hikari, and trains them in the ways of the Samurai. this is how they live. protecting the people of Japan from the Yami. 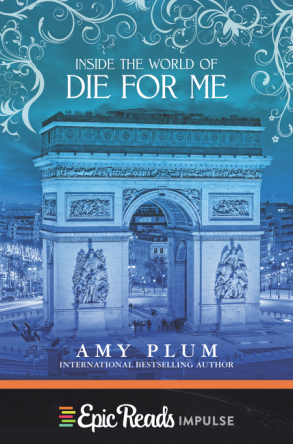 It’s just 3 weeks until the release of INSIDE THE WORLD OF DIE FOR ME, and I’m going to hold a contest countdown. I’ll be giving something away every day until Feb 9th, some days on Facebook, some days on Twitter (@amyplumohlala), and some on Instagram (@amyplum). 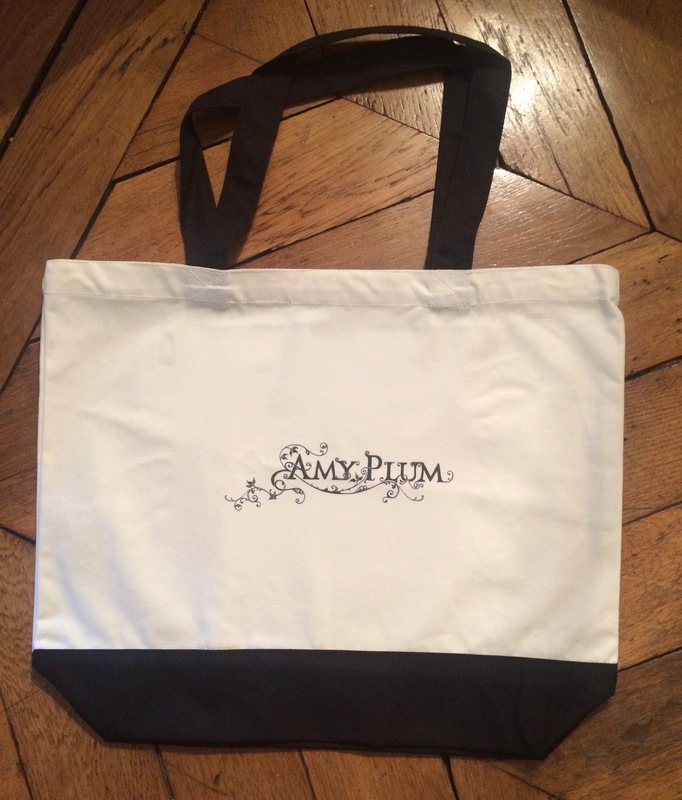 Send your idea in an email to katieloumercier@gmail.com and next Monday I will choose 1 entry to win the tote bag. Be creative! I can’t wait to see what you all come up with! Here is Rosalie Hobbs’s Honolulu entry for the Revenant Culture contest. (With her permission to post.) Enjoy!!! Here in Hawaii visitors only see a paradise. For the people who live here 24/7 it’s an entirely different story. Along with intense poverty; We hold the highest rates of teen suicides, meth addiction, and high school drop outs. For a place where culture thrives, there’s much turmoil hidden beneath the glamour. Contrary to the paragraph above, Honolulu also offers an energy of loyalty, love, and hope. My generation is made of dreamers and go getters who’s attempting to change the world one step at a time. When help is needed, support is given without another world. Families here stick together with fierce loyalty no matter how bad the situation truly is. There’s evidence of Bardia and Numa everywhere, even in our text books. Sometimes I’d like to think the most historical Bardia of Hawaii were our very own Monarchs of the old Hawaiian Kingdom. Due to the loss of sovereignty by Numa, present day Honolulu morphed into a Numa playground…. 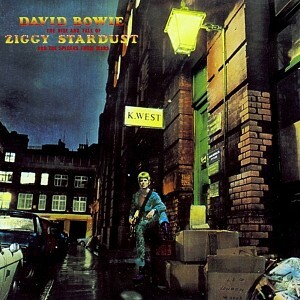 My earliest memory of David Bowie was buying his The Rise and Fall of Ziggy Stardust album at a garage sale in Birmingham, Alabama. I brought it home, having no idea what to expect, and was completely blown away. It made me feel things I had never felt. It made me feel wild, creative, subversive. It made me dream. For at least a year it sat on a shelf in my closet between my Barry Manilow and Amy Grant albums and silently mocked its neighbors with its superior European coolness. That experience taught me that the true evil is not in expressing yourself in a way others might fear or despise. It’s in condemning and banning creative expression. 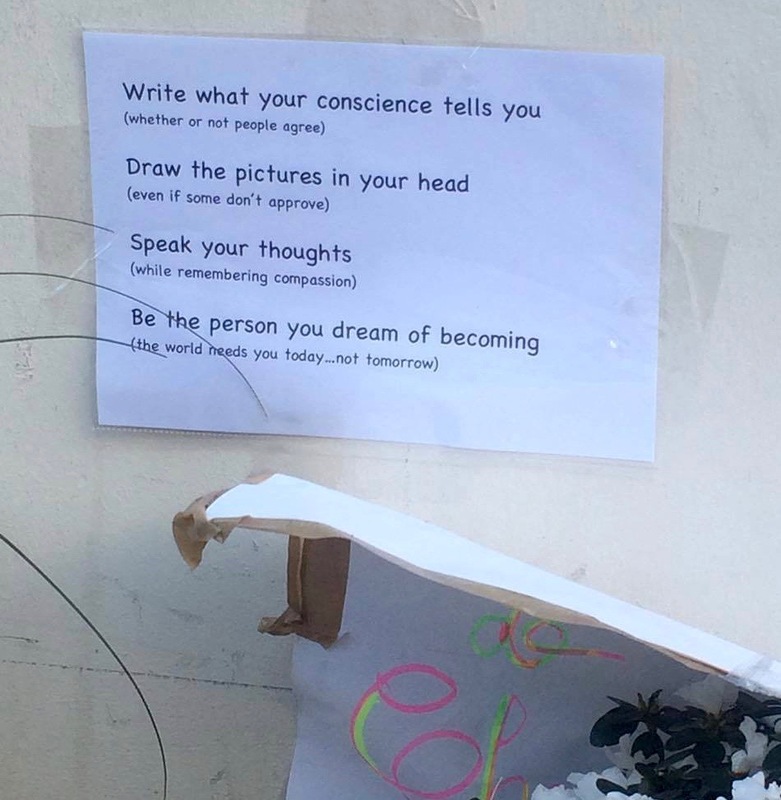 In destroying art. All of my respect to this creative force in human form. RIP David Bowie. You are and will always be a giant in my personal pantheon. So I chose the first thing that popped into my head: a Book Attack. 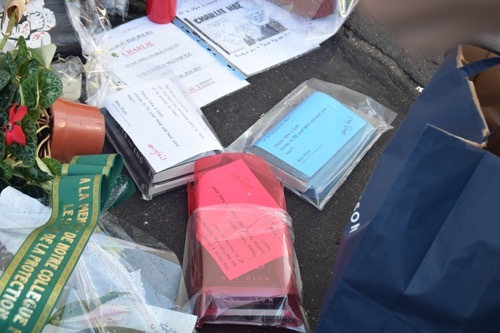 The polemic after Charlie Hebdo was all about freedom of speech, and not only do I believe (strongly) in that, but I also believe in the power and necessity of story. My stories aren’t groundbreaking political treatises. They have nothing to do with freedom of speech, besides the fact that I was able to write what I wanted and see it published. But my books are fun and entertaining and might just help someone forget their sadness for a few hours. So why not contribute a little bit of light to a dark day? “Books heal!” I thought, and started the wheels of my plan in motion. 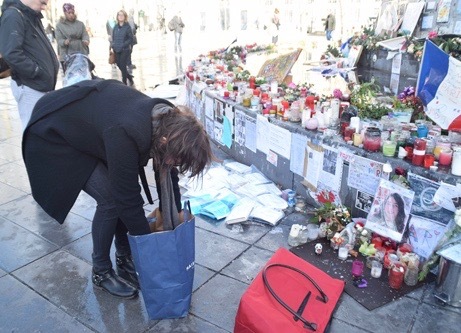 I filled a couple of bags with the books, and set out to the Charlie Hebdo memorial, a couple of blocks away. But halfway there, one of the bags had gotten so wet I was afraid it would break. Plus I was feeling a little bit chicken, thinking there might be cameramen there. So I rang my friend Fiona’s doorbell and she agreed to accompany me. 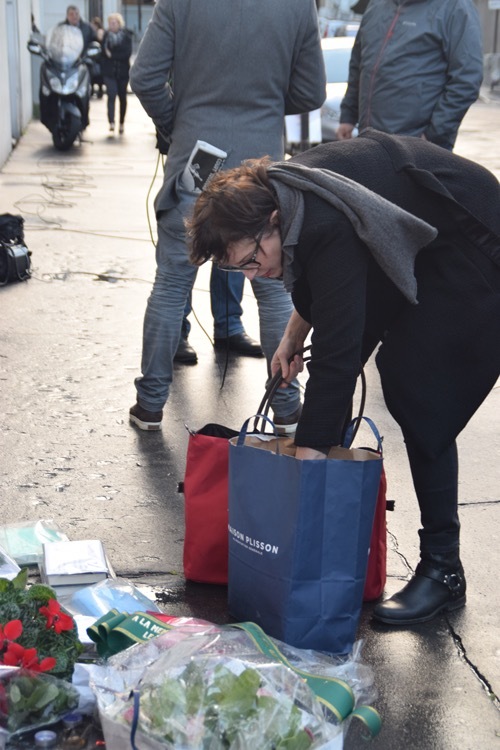 and then spread an assortment of books around on the ground. 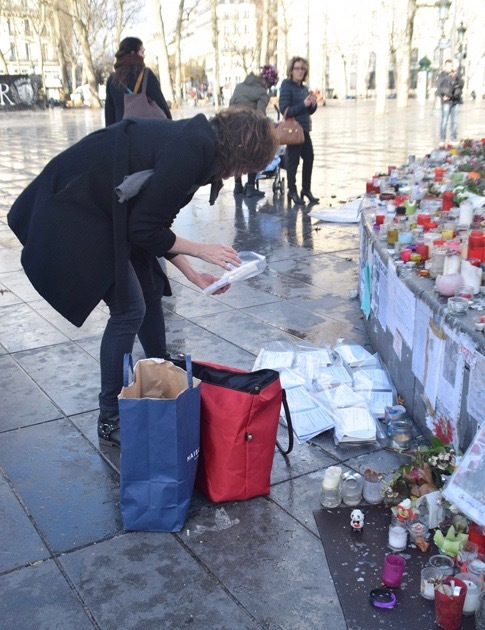 Fiona and I hightailed it out of there, and headed a few blocks away to Bataclan, where it looked WAY too wet and soggy to leave anything made of paper, even wrapped in plastic. 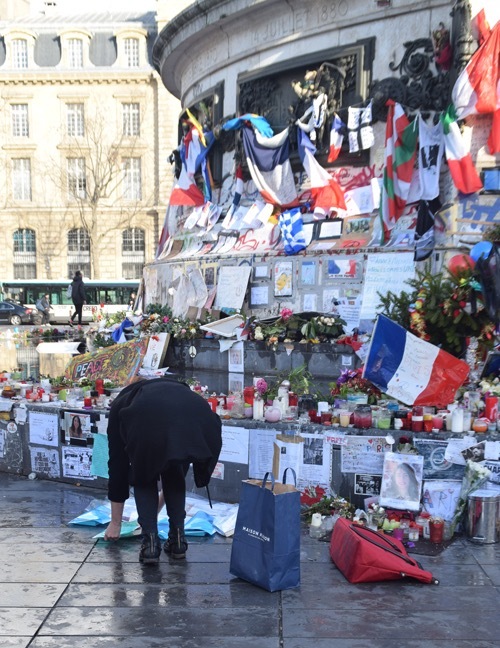 Plus, I wanted to focus on Charlie Hebdo, so we continued to Place de la République—the center of the Charlie solidarity demonstrations, as well as those after the November 13 attacks. We walked around the fountain, searching for the driest possible space, before settling on a patch that didn’t resemble a small lake. And then it was all go, go, go, and run away before anyone could ask any questions. 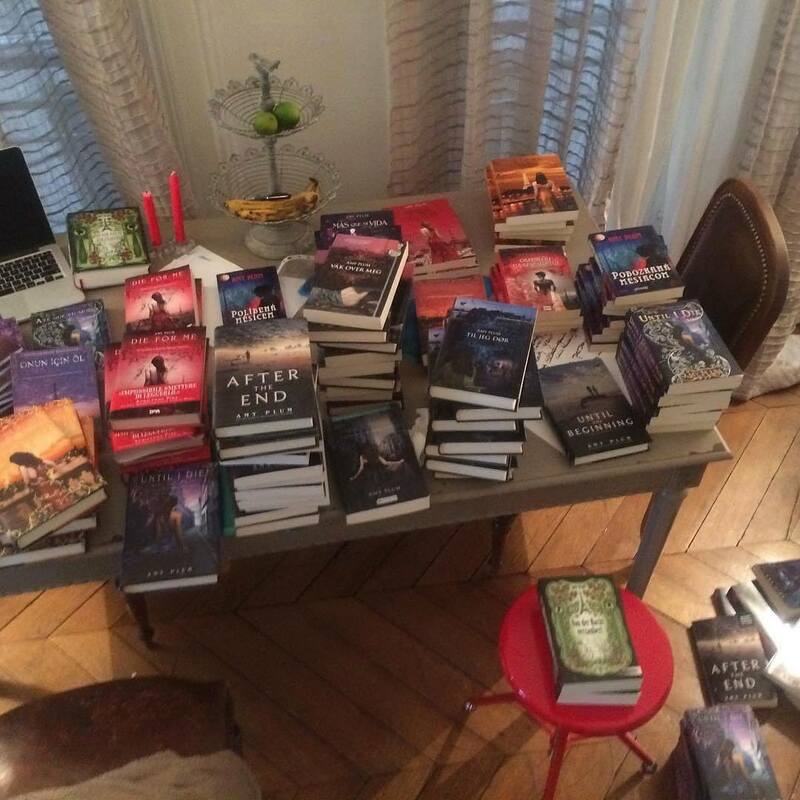 “Are you the author of these books?” she asked me in French. Oh no, I thought. I’m going to cry. Did I mention that’s also something that occurs when people interview me about things I care deeply about? I tear up. Yeah. There’s a reason I’m a writer and not a TV presenter. I turned and walked away as dignified as I could before grabbing Fiona and scurrying away. Mission accomplished. Project “Books Heal” complete. 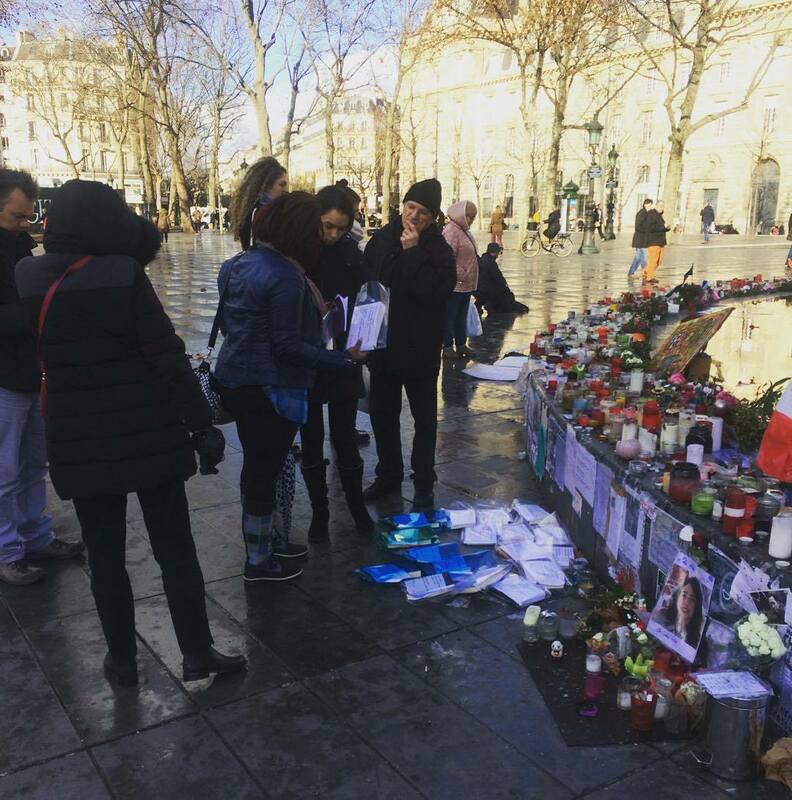 I hope it brought a few smiles and a little ray of light on this day of remembrance. 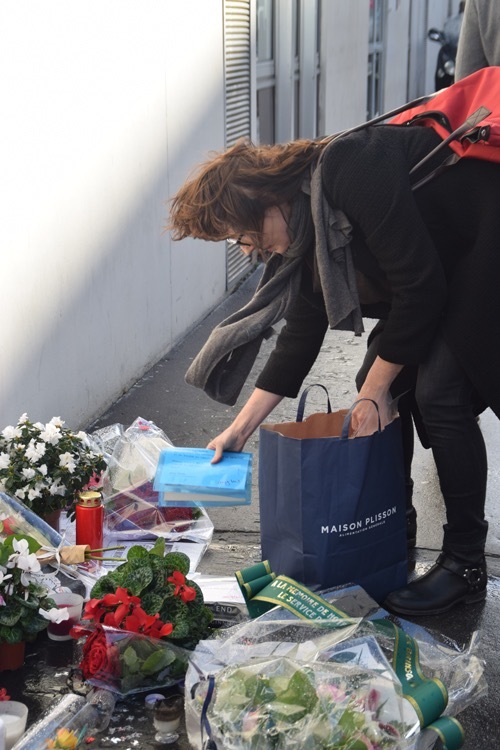 It’s been a year since the attacks at Charlie Hebdo were carried out down the street from me. So this morning, I sneaked down and taped this to the wall above the memorial before any of the lurking cameramen could see me. I also did something else super-sneaky…more on that in the next post! I believe this with a fiery passion. As in…incendiary.